Mrs. ReaderPants: MrsReaderPants Podcast--First Episode! I am super-excited today to announce that I have finally recorded my first-ever MrsReaderPants podcast! I've been thinking about starting a podcast for about a year now, but I just had no clue where to begin. This morning, the first full day of our Christmas break, I woke up and decided that today, I would make it happen. And I did! I wanted my first podcast to be a booktalk since my blog started years ago as primarily a book review blog. 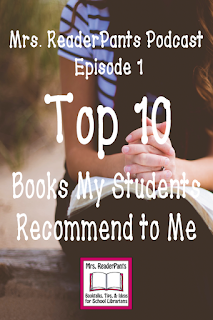 Today's episode is titled "Top 10 Middle Grade Books My Students Recommend to Me." If you are looking for some great books to read (or maybe for a holiday gift for the middle schooler in your life), these are very popular, student-tested and approved titles in my library. I would LOVE to hear any feedback you may have about the podcast. I know it isn't perfect, so please be gentle! I could not believe how many "ums" and "ands" and throat-clears I had to edit out! I'm already planning my next podcast, which I plan to make available on my blog and on PodBean next Tuesday. It will probably be another booktalk like this episode until I find my feet as a podcaster. After a couple of episodes, I will dive into library ideas, management tips, and lessons. I will post all future podcasts on this blog and to my new podcasting host, PodBean. I'm also researching how I can add it to iTunes and Stitcher, so stay tuned for that! It's a good thing it's Christmas Break right now because that is how I finally have the time to put this project together. Podcast music by Little Candle and used within the Creative Commons license and TOU. Episode 50 of the "What Should I Read Next?" podcast by Modern Mrs. Darcy--These podcasts are a must-listen for book lovers! Prepare for a huge increase in your TBR! So, what did you think? What would you like to hear about in upcoming episodes? This is perfect! I like how you listed the titles mentioned in the podcast. Thank you so much, Amanda! I've been really humbled by all the support I've gotten this week. Excited to work on Episode 2! So excited about this!! Our JH/HS LA team uses your blog quite faithfully. Now we will be able to listen too!! Thank you so very much for the incredible resource you are to me as a librarian too!! Yay! Thanks for your (and your team's) support! Very good...you are a natural so look forward to future podcasts. Thanks, Carol! Will be working on Episode 2 today! Enjoyed this very much. Keep it up!!! Thanks for the encouragement, Wendy! Planning to keep going--it's fun! Great review choices and music. I listened to this as I got ready this morning. This will probably become part of my Tuesday morning routine. I thought it was interesting how many of the titles you chose to review are also very popular at my middle school. I also plan on getting the few I don't already have and add them to the collection. Looking to next weeks podcast. Just started reading "Friends for Life" based on your students' recommendation. Thank you! I have been following your blog for a long time. I love it! You have so many wonderful ideas. I just listened to your first podcast and it is great! I can not read everything and this is a quick way to get new book talk information for my students. I am a Middle School Librarian. You are the librarian I want to be when I grow up, haha. Best. Compliment. Ever. I want to print it out and frame it on my wall. Thank you so much!